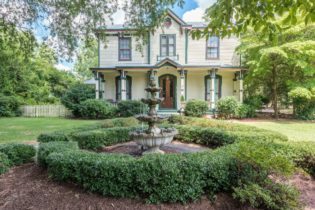 A Romantic New Bern, NC Bed & Breakfast. 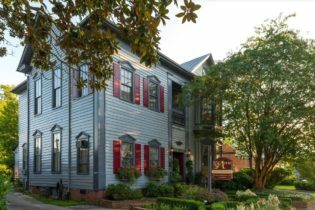 The historic Street-Ward residence, circa 1882, is home to The Aerie, the premier New Bern, North Carolina bed and breakfast inn and event center. The Aerie features a total of nine well-appointed rooms, each with private bath, modern amenities and tasteful décor that reflect the home’s late-Victorian heritage. Our Guest House offers two guest suites and a meeting facility to host events and functions. A long standing jewel in the Downtown Historic District is up for sale and ready for new owners! The Aerie, Luxury Inn and Event Center is comprised of two buildings, the main home ”The Street-Ward House” consists of 7 guest rooms and owner’s quarters which is owned. The Guest Cottage/Event Center across the street is leased from the Historical Society and has two more guestrooms and meeting/reception space for events. The Aerie is centrally located downtown within walking distance to shopping, restaurants, historic sites, river walk and parks. The Inn is being sold turnkey (real estate, furnishings, business and leased space). The Aerie has been an Inn since 1985 offering a luxury stay to visitors to our area. Elegant Bed & Breakfast with an European flair! Detached large pavillion well suited for weddings or special festive occassions. Some private balconies & working fireplaces available in guest suites. Built in 1920 and designed by noted Hendersonville architect Erle Stilwell. This home is on the National Registry of Historic Homes and is known as the Hobbs Mansion. The home was turned into an eco-friendly bed & breakfast in 1996, but managed to preserve the old world grandeur. Located within short distances to outdoor & interesting indoor activities – DuPont State Recreational Forest, Flat Rock Playhouse, Holmes Educational Sate Forest, Carl Sandburg Home National Historic Site, North Carolina Air Museum, Henderson County Heritage Museum, Jump Off Rock, Team ECCO Ocean Center & Aquarium. Enjoy the day just exploring the shops & restaurants on Main Street! 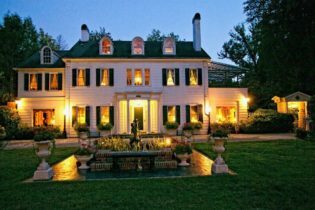 Grand Italianate Inn + 3 cottages in central Historic District near I-95. Wilson, NC home of the Annual National Whirligig Festival. A 5 min walk makes The Inn a convenient host for Barton college guest speakers/ professors. Explore downtown Wilson quickly growing with new shops, art, antiques, bars and restaurants! 1hr drive/ 55miles East of Raleigh, NC. Near I-95 makes the perfect halfway stop for NY - FL travelers! The Whitehead Inn Estate features 4 historic buildings, separately metered, totalling 9,355 sq ft, plus an additional 803 sq ft conditioned/heated storage building, a vacant lot, and 17 paved parking spaces on 1.42 acres. For Sale Offered at $675,000. Zoned mixed use residential, commercial, weddings/events, retail, restaurant, office, etc. This unique Historic Estate features beautiful landscaping, porches, detailed trim, original hardwood floors, tile bathrooms. Individual thermostats in every bedroom! Appliances, exquisite antique furniture, art, mirrors, lamps, china, silverware, and more are included. Inn operation has been closed by absent owner, however the property is being meticulously maintained. HVAC has been on consistently. Weekly Caretaker checks for leaks, sump pump, exercises utilities/faucets, routine maintenance, cleaning service, ground maintenance, landscaping. The Queen Anne building is currently rented as residential. $1090/month. 60 days notice to vacate. 5 year tenant would like to stay. Historic taxed at 50% tax value, $2771/year! Whitehead Inn- 5 Bed, 6.5 Bath, Kitchen, Formal Dining, Living Room, Den, Laundry with W/D, Foyer, Porch. Barefoot- 3 Bed, 4 Bath, Foyer and Waiting Area or Living Room, Kitchen, Wheelchair Ramp, Porch. Carriage- 2 Bed, 2 Bath, Foyer, Porch. Queen Anne- 4 Bed, 4 Bath, Kitchen, Living Room, Porch. Currently Rented $1090/month. 60 days notice to vacate. Seller to pay for Home Warranty for 1 year at closing, at cost not to exceed $2000. Seller to provide list of 1000+ repeat clients if reopened as B&B. So many options for this unique property!! Ready to re-open as B&B! Or professional office space, lawyer, accountant, massage, weddings/events, retail, restaurant, residential use or rental, college housing, sorority/fraternity, Barton Professors/employees, guest speakers and more! Come see for yourself! !